I've reviewed Sarah Wimperis' other book from the Quick Draw series on urban landscapes. This new book is about drawing people. When it comes to drawing people and portraits, the audience looking at them would usually be more critical. I don't feel that the illustrated examples in this book are that good. Examples in the Urban Landscapes book was alright, not the best, but fine for the topic. But the artworks here look a more amateurish. The techniques featured often needs more elaboration for a book that is targeted at beginners. Doesn't help that the text are printed with extra large fonts that take up more space than they should. I don't think the book is worth the money even though it is quite inexpensive. 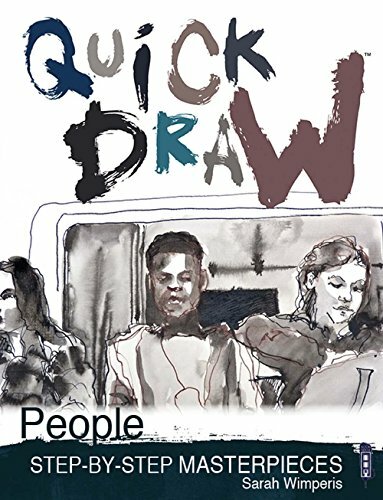 I recommend you check out either 5-Minute Sketching and Sketching People: An Urban Sketcher's Manual to Drawing Figures and Faces instead.